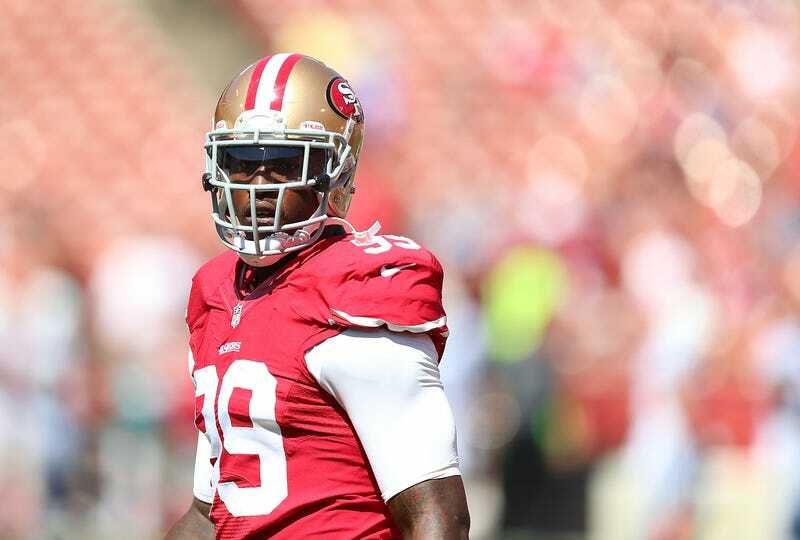 San Francisco 49ers linebacker Aldon Smith was arrested at Los Angeles International Airport today, according to multiple reports. A statement by the airport's police does not mention Smith by name. The person detained was a "25-year-old male." Smith is 24, and will be 25 in September. Despite the age difference, Adam Schefter reported that the man was indeed Smith, according to a Los Angeles police information officer. At approximately 1400 hrs, a 25-year-old male resident of San Jose, California, was going through Terminal 1 screening and was randomly selected for a secondary screening. The suspect then became belligerent and uncooperative with the process and with the TSA agent, making a comment indicating that he was in possession of a bomb before proceeding towards the gate area. Los Angeles Airport Police made contact with him at the gate and he was positively identified as the person in question. Once again the male subject became uncooperative and he was detained and taken into custody by Airport Police and is currently being transported to LAPD for booking. "I heard him say, 'I did nothing wrong,' " Egans said. "The whole thing ratcheted up from there. The cops were trying to calm him down. He wasn't out of control; just agitated." TMZ acquired a video that they claim is Smith being detained. He tells an officer he's "embarrassing" for detaining him.